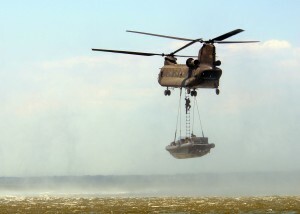 Boeing delivered the new, updated CH-47F Chinook helicopter to Army officials last week in Pennsylvania featuring a variety of improvements over previous Chinook models. The heavy-lift transport helicopter is specifically designed for cargo missions, moving artillery, ammunition, troops, fuel, and supplies among other things. With this in mind, one of the major improvements made on the new Chinook choppers is the cargo-on-off-loading system, which gives soldiers the capability to reconfigure the floor of the aircraft for cargo delivery missions. In addition to cargo missions, the CH-47F Chinook helicopters are sometimes used for search and rescue missions, fire fighting, disasters, and medical evacuations meaning frequent repairs cost a lot of money and need be avoided as much as possible. In order to eliminate the need for frequent maintenance, Boeing installed a system designed to assess the health of the aircraft in real time on the latest Chinook. This delivery marks the first of 155 new Ch-47Fs to be given to the Army, as a part of a $4 billion multiyear contract signed in June of last year.